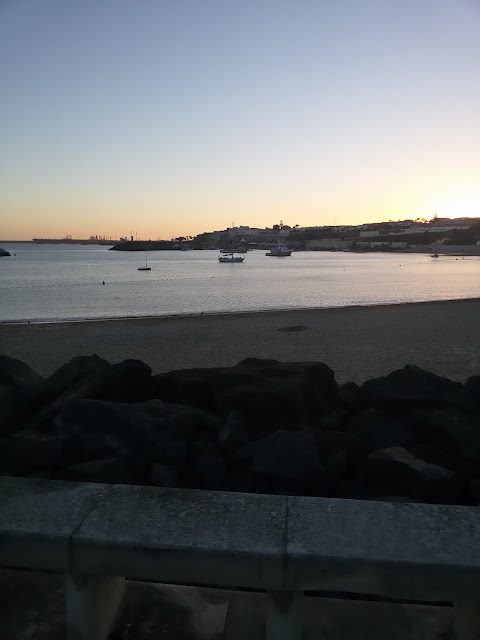 Anyway, I left Sines as darkness turned to dawn and then sailed most of the way to Alvor, for a total of 15 hours. Sailing past Sagres in late afternoon the wind was a notch worse than hellish. 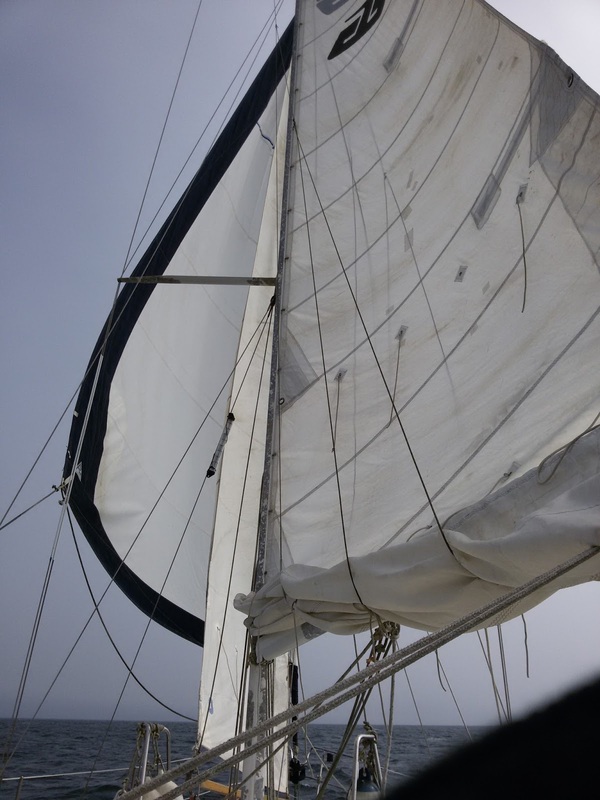 At one point my 11-ton dirty-bottom boat was doing 5.2 kt flying only the small staysail. 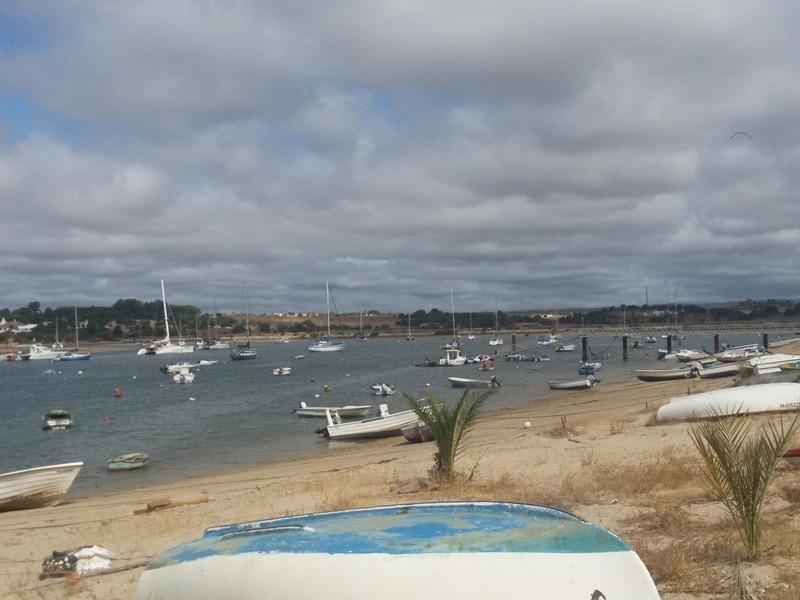 During the 3 nights I spent in Alvor I noticed three things: the place has slowly been filling up with private mooring balls, there's less cruising boats anchored (which could be related to the fact that many boats run aground if they follow the two channel buoys - that's what you're supposed to do, right, and yet there's a sand bar between them that's doable only near high tide, so you have to steer an arch from one buoy to the other) and the town is becoming insanely crowded at night with tourists. Notice the depth between the green and red buoys - talk about a grounding trap. You can't trust buoys anymore. This is the latest and updated Navionics chart. Any older version of any chart will show a nice clear channel. Jakatar is in the very middle and the only boat that is anchored. Even the big catamarans to the left have been on moorings for years. There were about 10 sailboats anchored in the wider part of the channel to the left. It's still early and the streets are only about half-full at this time. Next, I sailed to Culatra ever so slowly. 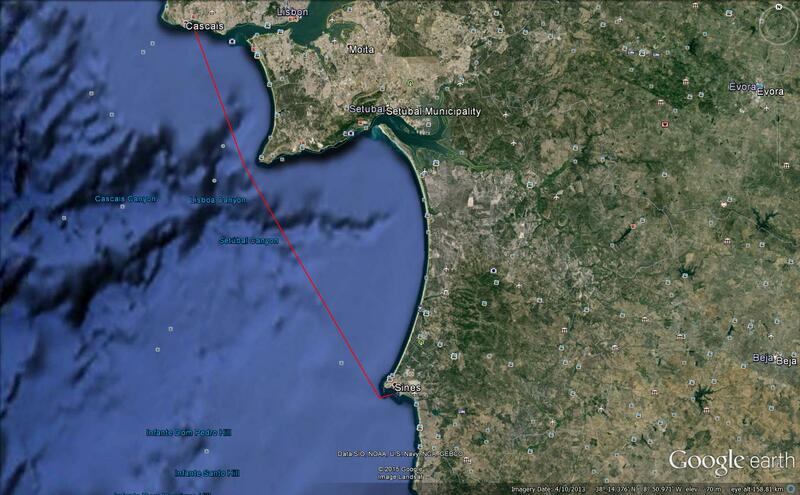 In two tacks I reached Albufeira where I anchored outside the marina breakwater for a rolly night. The next morning I motored into the marina and got 150 euros worth of diesel, 6 euros of gasoline and lots of free water. I then sailed slowly to Culatra. About 4 miles from the entrance the wind fizzed out and I was forced to start the engine. In the anchorage, while getting the anchor ready a guy on a Belgium flag boat started acting like a lunatic screaming that I was too close. I made signs that I was just getting things set up. He kept shouting so I ignored him, after which he ran up to the bow of his boat and nearly had a fit...he was thrashing his arms so wildly I was worried one of them might fly off his shoulder. Did he think I was so stupid as to anchor right in front of him? Feeling a bit ticked off about it, I took my time about getting the anchor ready as his screaming got louder and louder: I untied the two lines securing the anchor, released the anchor clutch, carefully eased the anchor off the roller until it was dangling close to the water, fished out the anchor ball, the anchor snubber, and a line I tie to the chain in case the snubber fails. By then I was about 15 m away from his boat. When I stood erect, looked around and made my way back to the cockpit, he fell into silence and disappeared into his boat, realizing I had no intention of anchoring there. I had already picked a nice open spot farther ahead. In the end he got the last laugh, as you will find out in my next post. Not only that, much later, back in Alvor, I was placed in the same position as the screamer during the most pathetic anchoring attempt I have ever witnessed. At 8:00 a.m. - after a good night's sleep in the bay of Cascais - I raised anchor, motored out, raised all sail, shut down the engine and sailed south. Sort of. I always get fooled by the false morning breeze near most harbors. After a coupe of hours of motor-sailing and slow sailing, I finally got a good northwest breeze and sailed all the way to Sines. David, although he got up later, had already motored by me in his Bavaria 32. David doesn't really sail his boat. He motors in all conditions: a) if there's not much wind, he needs to motor, obviously; b) if the wind is right, he unfurls the genoa but continues to motor to go faster; c) if the wind is too strong, he furls in the genoa and motors to keep it comfortable. Also, his puny in-mast furling main sail is useless, and I don't think he's used it in years. I arrived in Sines at about 7 pm and anchored. The government-run marina only costs about 18 euros per night but I couldn't be bothered with the docking lines, fenders and checking in. I took a sponge bath, met David in town and went for dinner in the old part of town where I had a delicious dish of grilled squid. Jakatar in the center, taken on the way to dinner. Sailing wing-on-wing without a pole. The boat is anchored in Culatra and I'm back home temporarily taking care of some business. At high tide, Jakatar is swinging on 4:1 scope. My main fear is that a clueless marina skipper - and there's no shortage of them - will anchor too close and pull up my anchor in the process. I left Peniche solo on July 26 at 10:30 in the company of a a Bavaria 32 sailed by my friend David, also solo. I left the marina with one concern gnawing at me: my new 25 kg Kobra anchor was/is attached to two pieces of spliced chain totaling 35 m, which is not the ideal situation. * Not forgetting last year's anchor disaster, I do have a spare 45-pound plow anchor on 15 m of 8 mm chain and 40 m of line stowed in the sail locker ready for deployment. The trip was a mix bag of sailing, motor-sailing and motoring. At the dreaded Cabo Raso (which should be renamed Cape Fear), the wind was only about 25 kt but we hit a wall of fog. Wind and fog don't usually mix, but Cabo Raso is a devilish place where anything can and will happen. I was quite amused to see a large ketch that had been shadowing me farther offshore disappear into the fog. In a matter of minutes, I saw it motoring back at full steam, after which it spun around facing the enemy, like a bullfighting horse turning on its hind legs to face the bull from a safe distance. I don't blame them. They were obviously going farther south and about to enter a busy shipping lane. Sailing past Cabo da Roca. The infamous Cabo Raso is just down the street. 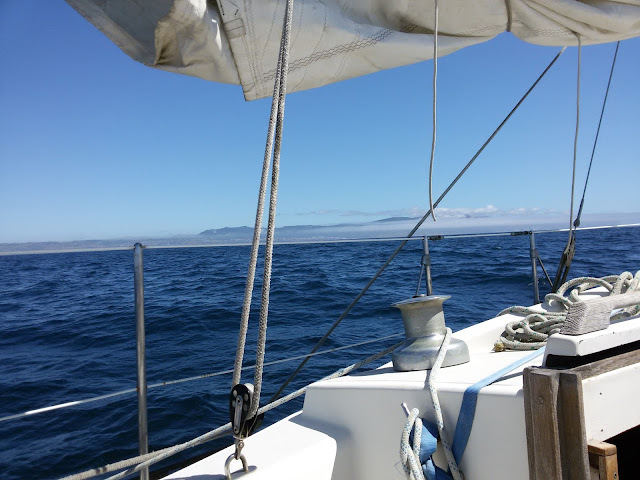 You want to start thinking about reefing here, and I had already dropped the main. Although Cabo da Roca may not look like much from a distance, notice that that it reaches the clouds...or, should I say, creates its own cloud system. An hour later I was anchored in the sunny bay of Cascais sipping a small glass of wine. That's my ritual while waiting for the anchor to dig in. 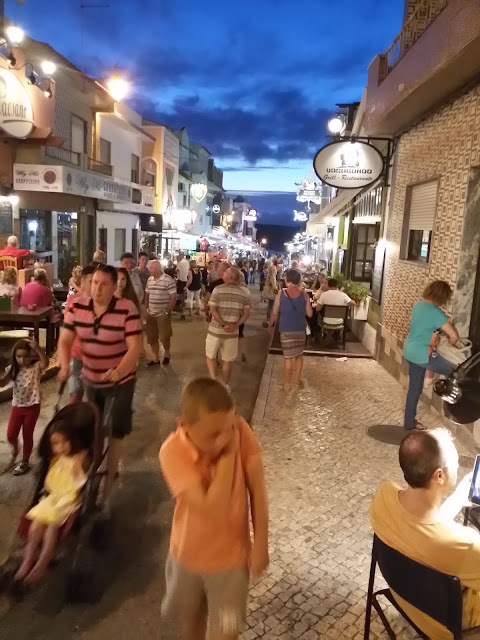 We went ashore for dinner at a local restaurant that is getting more touristy and expensive as the years go by. The sardines were dry and the owner, on recognizing us, insisted on telling us his life story, which you probably don't want to know. I'll tell you anyway. He claims to have been a barefoot, poverty-stricken kid who left home at 14 years of age, went hungry, worked hard and now works even harder. "Slept only 3 hours last night," he boasted. I think he was merely distracting us in the hope that we wouldn't notice that the sardines were like old leather shoes. Next time maybe I'll eat on the boat and spend the money on drinks at a sleazy bar. I've heard that bored middle-aged women are attracted to the smell of seamen. Speaking of marina skippers and anchoring, going back to the boats we found that David's boat had dragged onto a fisherman's mooring buoy which had a filthy shuttle boat on it. The mother boat must have gone out for the night. The lines were fouled on the Bavaria's rudder and we had to do some cutting and retying, not before David cut the wrong line holding the dinghy connected to the buoy. Sitting on the oily dinghy, I caught it just in time and found myself holding the line that kept the dinghy and David's boat from floating away. Grunting and groaning, I finally managed to tie the nylon line to an oar lock. Slept like a rock (or is is it "slept like a log"). I always sleep well, but it feels better on an anchored boat that's going somewhere. Take note owners of a SL 555 Sea Tiger windlass looking to buy European chain. If your windlass has a gypsy with 7 pockets = RCB70 – only 10 mm DIN 766 chain will fit (which means that the chain links are exactly 48 mm in total length. After losing all my chain last year, I ordered a 15-m test piece which I would use for the spare anchor. It was a perfect fit. The problem was that they gave me the wrong reference number. I used that reference number to buy 60 m of chain and, because of the wrong original reference number, I got the wrong chain. The shop didn't want to take responsibility until I showed them two bills of sale for chain with the same reference number but different sizes. Seeing as they couldn't get the right size chain quickly, they lent me a 20 m piece they had at the shop, which I joined to the original 15 m test piece. It does the trick for now if I anchor in shallow water.